I was lucky enough to get a bundle of fat eighths from Riley Blake, but before I received them I thought more about the competition rules and designed a quilt that was going to require much more fabric than the sample bundle. Making something fantastic that is quilted should be right up my alley, but I needed to make something I had never made before. AND I needed to challenge myself to learn something new. 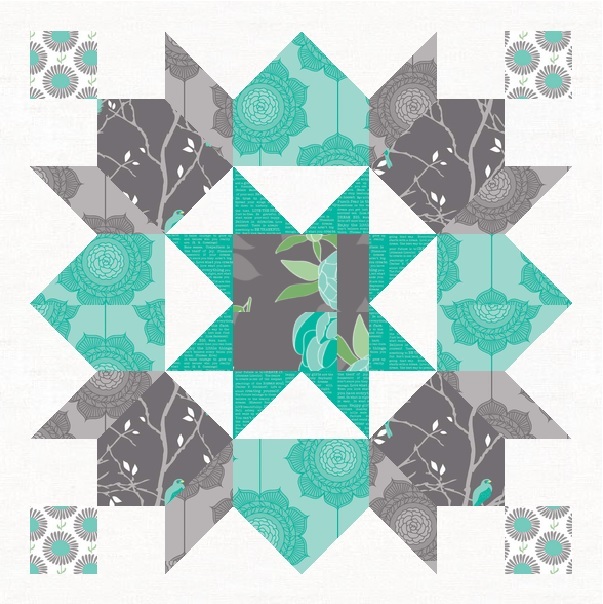 Well, another trend in the quilting world that I had not yet taken part in is the beautiful swoon block. 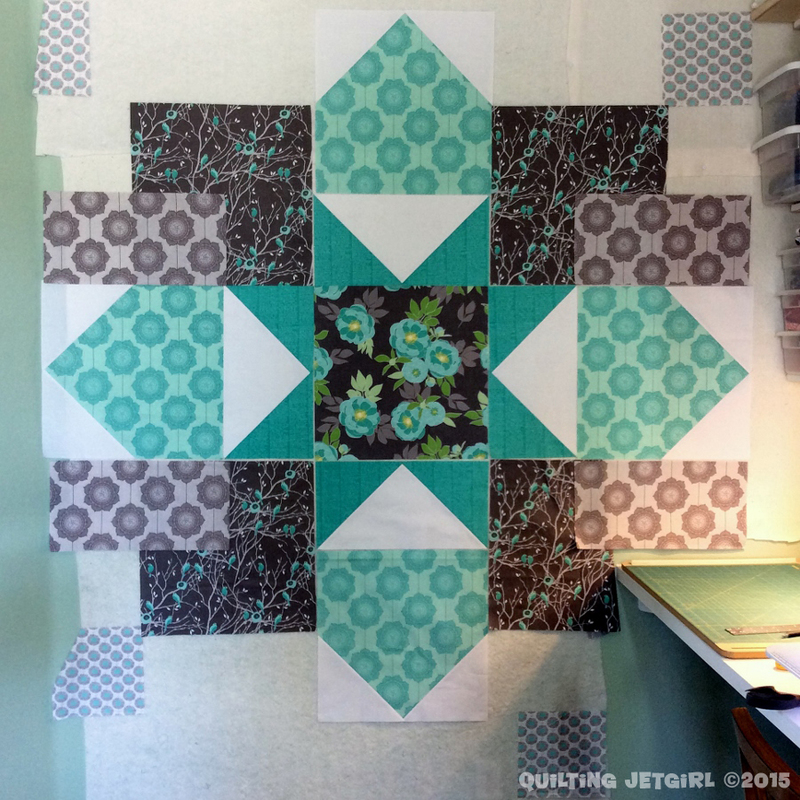 I decided to make a large, graphic swoon block as a quilt to feature the large scale prints (the swoon block will finish at 72-inches square and the quilt top will finish at 80-inches square!). And I decided that my challenge would be to keep each cut of the Cottage Garden print fabrics as a whole piece of fabric, meaning I get to sew Y Seams for the first time! I spent quite a while playing around with the right distribution of fabric in the pattern, and I finally settled on the layout shown above. My design hinged on the use of a coordinating Riley Blake solid (clean white), and this is where I hit my first hurdle in the process. I plan to back the quilt in the solid, and in all I knew I was going to need 8 yards. I could not find Riley Blake solid yardage of any color online when I went looking (let alone the clean white). After much internet scouring, I finally found a small quilt shop in Oregon, The Rustic Rooster, that had barely enough yardage. Whew. Unfortunately, the shop owner had just run a sale and had sold the clean white down below the 8 yards I ordered. No sweat. I placed my order on March 23rd, and the fabric challenge ran until July 15th, so I figured I had plenty of time for the shop to get in a new order. 2 months later, I figured it was time to check in. The shop owner was beside herself and wanted to refund my money: Riley Blake had the clean white she ordered on back-order and she had no idea when it might come in. I asked her to hold on to my order, and I went back to looking on the internet for anywhere that might have yardage. It seemed like perhaps the MQG members had really cleaned things out, and so I kept waiting. Almost 3 months after I placed my order, I did receive the 8 yards in the mail, and I couldn’t be happier to finally get started making this quilt top! Starting to make the quilt top meant taking my time and meticulously cutting out fabric for piecing. I wanted to try to make sure to feature each fabric to its best potential. I also wanted the text to all be right side up when pieced, the lines in the “wallpaper” prints to be running vertically, the flowers to be right side up, the birds to be right side up, etc., etc., etc. Also, I must note that my friend Kitty @Night Quilter has influenced me to say meticulous cutting instead of fussy cutting, and if you follow the link to her blog you can read her thoughts on why. Things were going along great until I got to cutting the grey cottage wallpaper print. At that point I realized that my original order of fabric was not going to be sufficient. I quickly checked to make sure Hawthorne Threads still had plenty in stock, and placed an updated order to get me the additional 5/8 yards that I am going to need and I ordered some coordinating Aurifil 50wt thread for quilting at the same time. I decided to use 2021 (white), 1148 (light jade), and 2620 (stainless steel). 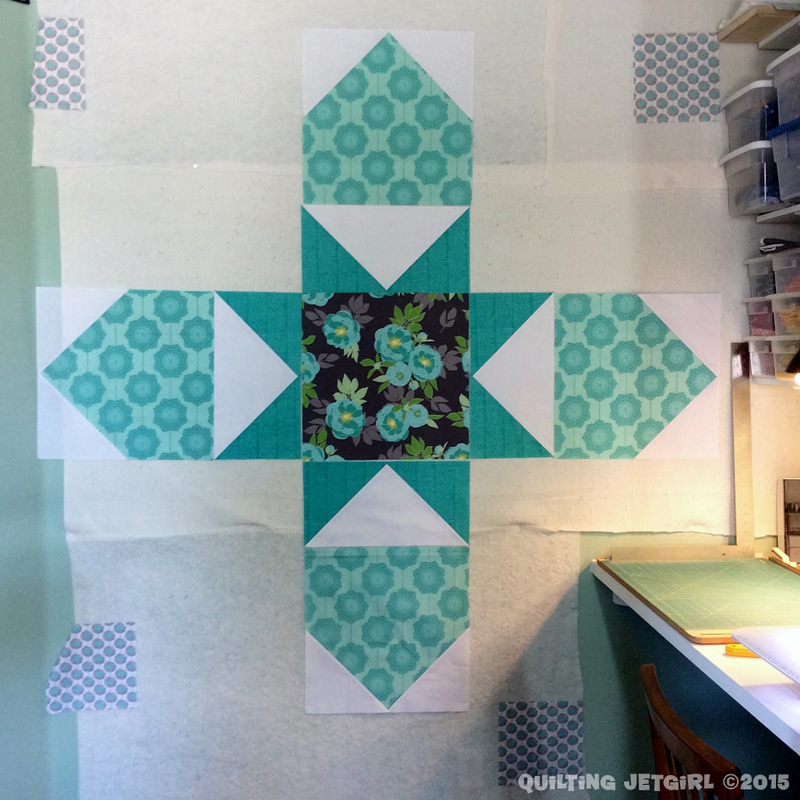 Giant Swoon Block – First Y Seam! I kept working with what I had, though, and I was able to tackle my first Y Seam. I am pretty pleased with how it turned out, and I am excited about how the quilt top looks with all the progress I can make before I receive more fabric. I now have 4 Y Seams complete and 4 more to go! Hopefully things will go smoothly as I work to finish the quilt… I’m crossing my fingers that there isn’t some 3rd fabric blunder that will occur! This looks great! All the care you’re taking to order fabric and cut (meticulously!) will surely pay off. And kuddos on the y seams!!! I still need to try them. Nice job. The colors of the fabrics really draw me in. I am “swooning” for your quilt. (I couldn’t resist) It looks great and I love the large print. Needing more fabric and not being able to find it is my worst fear. I made a quilt several years ago using Moda’s Lucy’s Crab Shack fabric quite sometime after it came out. It took forever to find more when I needed it. Sometimes you have to be thankful for the small online quilt stores. They can be life savers. The patern is perfect for the beautiful fabric! Looks beautiful! 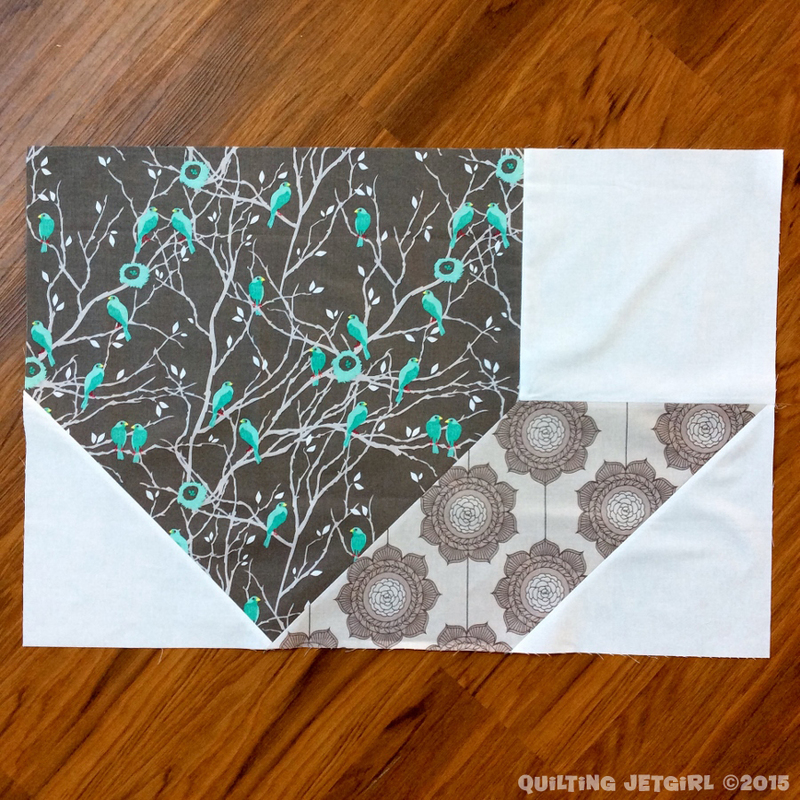 I wonder if there are tutorials out there for doing the swoon block this way and using Y seams. I know I’ve read about it, but I don’t think I’ve seen any diagrams or tutorials (hint hint). You know what’s funny? When I first started quilting I picked a pattern with y seams because I didn’t know any better. I did them and they turned out pretty great. And I haven’t done them since. You’ve inspired me to try it again as soon as I’m allowed to start a new project! Great looking project! Your giant swoon is going to be great. I have never tackled Y seams before, that is on my to-do list. My Riley Blake project is going to be with triangles. (I share your pain on finding the Riley Blake white, I was able to get my 3 yards from an etsy seller). Ooooh it looks awesome! Great use of those fabrics! I’m glad the white became available in time, but sure seems like it’s cutting it close. Light Jade is one of my favorite Aurifil colors! Looking good! Great use of those large-scale prints. Congratulations for persevering. I like how the block was designed and even more as it becomes reality. Love the colors. Wow! This is looking so good. Love how you are so careful with the directions and large prints. very nice! I can’t wait to see how it looks once the whole thing is together. Y- Seams seem reasonable enough in theory, but I’ve still been too afraid to try and tackle them! Oh I love a swoon block. It is on my ‘list’ of things I want to make. How big is this going to be? Y seams are intimidating to me and I have yet to try them. 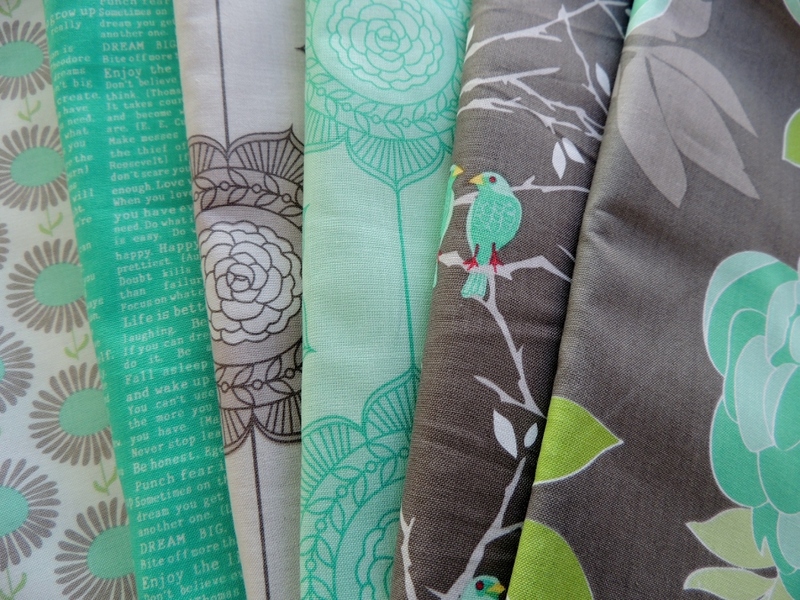 I signed up for the MQG Michael Miller challenge and should receive fabric in July. I am currently racking my brain for ideas for the project. So far I don’t have one that I really like. I need inspiration!! While you are at tips and such, consider something about handling giant pieces. I am more overwhelmed by 20+ inch HSTs than Y seams. Thanks for the link to the post about “fussy cut”; another word to expunge along with “wonky.” Oh, and I like your giant block! HUGE! Its going to be amazing when its finished! I admire how you didn’t panic, just kept finding the fabric! I have never made a swoon block either and you know, ‘Y’ seams use to intimidate me but they are really pretty easy! I guess I had better get going on my Riley Blake Challenge piece too! Can’t wait to see this finished! I admire how you worked to find a suitable design. Love the attention to directions! How are you going to quilt it? I’m so glad the fabric problems are resolving for you. I’m sure you never thought they’d be the challenging part of the challenge. The giant block showcases the fabric prints beautifully, especially as you are taking care in your positioning of each one. And yea for your conquering of the Y seam. It looks great! Missed that whole fussy versus meticulous – will go check that out. There is something really lovely about a giant block quilt – really seems to make the most of the fabrics. Glad you were able to get by all the fabric challenges! Congratulations! You’ve definitely inspired me to take on a future challenge. Your y seams are very neat. I’ve been procrastinating on one project because I’m a little worried about how mine will turn out. Time to get to work, I think. Oh man is there anything I could do to convince you to just mail it to me when you are done? I don’t know how you were able to wait that long for your fabric I would go out of my mind. Oh, how exciting! I think the quilt you are designing is unique and lovely! Hopefully, all the remainder of the journey will be fun and thrilling. Thanks for sharing and have a great day! Great design. Can’t wait to see it finished. Your quilt looks amazing. It must be very strange working on a scale so much larger than usual! This is lovely. I think all the attention to detail and patience waiting for fabric will pay off. I am sure that you have already conquered the Y-seams. Not so scary now, eh? Those colors! that is always a lovely palette of colors and it reminds me of the ocean… can’t wait to get back in August! I’ve always wanted to do some type of large star quilt, although I have not done Y seams before so BRAVO and it looks great so far and I am sure it is going to be an awe dropping one once it is done! Can’t wait to see! 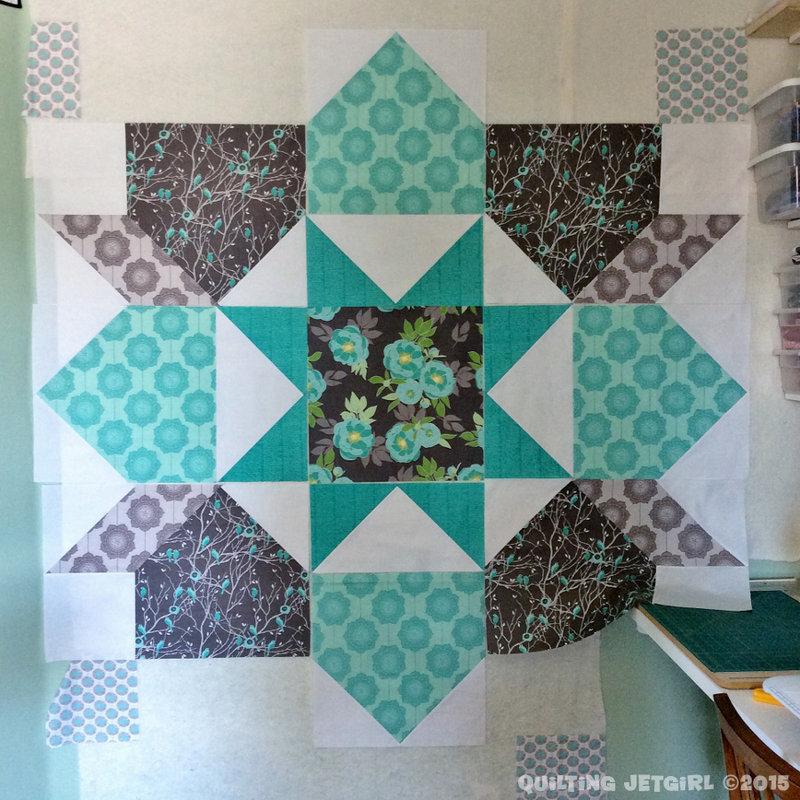 This is looking gorgeous already – love those colours, and I frequently find I have a soft spot for quilts from oversized blocks, it works so well with your fabric and the design here. I’m going to read about the use of the word ‘meticulous’ now – ‘fussy cut’ has always been a phrase I’ve disliked so I’m intrigued!